Order in your own time, 24hrs a day, 7days a Week. No messy Account Apps, Holds & Limits. Just simple & easy on-line payment. On-line ordering means you no longer have to be reliant on your local or regional supplier. Total price transparency. You know your unit pricing and total spend at the time of placing your order everytime. Paper Coffee Cups - Coffee Cups Online has the best selection of Paper Coffee Cups, from Single Wall, Double Wall, Triple Wall and ECO friendly. 1) Single Wall Paper Coffee Cups - For the price conscious the Single Wall Cups are the way to go. We have all the sizes in 4oz, 8oz, 12oz & 16oz Cups. Choose from Plain White or Plain Matt Black or our very popular Black with Swirl design. Looking for something different to plain White Flat Lids? We have Black Flat Lids and Sippa Lids with a spout, available in Black & White. For a premium lid, go for the Matt Black International Paper Hot Lid. 2) Double Wall Paper Coffee Cups - For those who demand extra insulation, go for the Double Wall Paper Coffee Cups. These are basically a Single wall cup with a second layer of paper adhered to the out-side with a small air pocket between the layers of paper to provide insulation from those super hot coffees. 3) Triple or Corrugated Wall Paper Coffee Cups - Another insulated Coffee Cup alternative is the Triple or Corrugated Wall Paper Coffee Cup. Avaiable in Plain Black and Brown Kraft in 8oz, 12oz and 16oz Cup sizes. Also, very popular are the Callisto Coffee Cups for those stores looking for a point of difference. They come in 4 colours, each with a distinctive design, mixed into each carton. 4) ECO PLA-Lined Paper Coffee Cups - For the environment conscious, FPO have our range of PLA lined coffee cups with Lids, in both Single and Double Wall coffee cups. This means that the inside of the cup has a plant based substrate instead of a petro chemical based liner as with standard coffee cups. 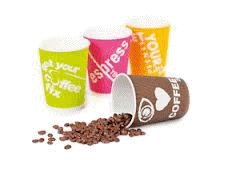 ECO-PLA Coffee Cups are available in Plain White and Brown 'Cup to Grow' PLA Lined Paper Coffee Cups with Lids.